Of course you could also use normal, unpreseved leaves, but these will wither very fast. Alternatively you could buy artificial leaves from the craft store. Basic wreath shapes are also easily available, if you don’t want to craft one yourself. 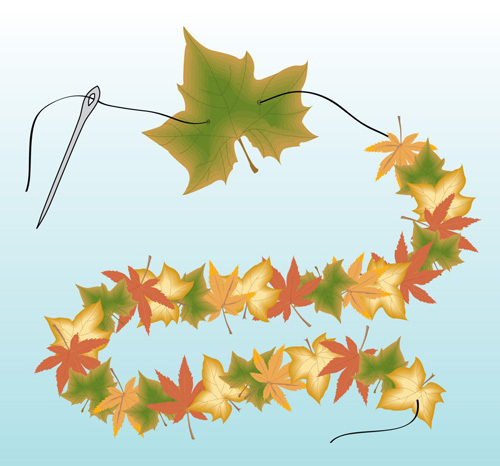 To decorate your wreath, make a leaf garland. Just pick out some yarn in a nice autumnal color and thread through the leaves. You will get the best results if you thread through every leave twice! Then all you have to do is to wrap your leaf garland around your wreath and secure it. If you want to have a little more control on how the leaves are going to be arranged, thread only through 2-3 leaves at a time and secure the thread on the wreath where you want the leaves to be. You could decorate the whole wreath this way, or leave out some parts. I wrapped a nice ribbon around the leaf-less part of the wreath and quite like how it turned out! 🙂 The leaf garland would also work beautifully on its own! You could decorate your door or window frames, or just hang it up somewhere. Many thanks I had bought a dreamcatcher for the Cardenas but it was obviously made with cheap string this is a perfect tutorial as it covers everything and I feel a new hobby coming on..also as a male pensioner I have limited resources so can try making Christmas wreaths for presents..again a massive ty..